RapidFix can produce High strength bonds in seconds. The RapidFix adhesive dries crystal clear and bonds most material instantly. RapidFix welding powder is used in conjunction with the adhesive to repair all types of holes, cracks and gaps and can produce a strong weld seam to support the repair, just like solder or a welded joint. RapidFix can also be used to build-up or replace missing areas of the part. RapidFix can be instantly drilled, filed and sanded. Because it dries clear, it can be easily painted or stained to any color for an aesthetically pleasing repair. RapidFix is the only product that can instantly repair windshield wiper blades, radiator overflow tanks and air intake systems. RapidFix can also repair gas tanks, radiators, headlight housings and can be used for electrical wiring. Unlike all other instant adhesives RapidFix has a special formula that will not dry out in the bottle. The product is backed up with a 12-month guarantee. RapidFix is a unique product as it combines the ability to both instantly bond materials together and to also fill gaps, cracks and holes. The list below will provide a guide for you. Repair hoses, door trims, toys, rubber seals, rubber sporting goods. Repair ceramic pottery, glass ornaments and floor tiles. RapidFix dries crystal clear for a invisible repair. If filling is required, the welding powder dries neutral and can be colored to match the piece. Repair breaks, cracks splits & holes in many types of plastics that are used for appliances, plumbing, sporting goods, and toys. Can be used to instantly fill holes, cracks, gouges in many items such as doors, frames and floorboards. It can also be drilled, sanded, painted or stained. Use on boats for repairs outside and inside and personal water craft. Make those emergency repairs at the dock or out on the water. Sports equipment, bikes, fishing and model making. Hiking, camping, instant repairs for many parts of the RV, horse trailer, etc. Why use RapidFix instead of something else? The RapidFix Dual Adhesive System offers two types of Instant repairs in one product – binding materials together and filling holes or gaps. 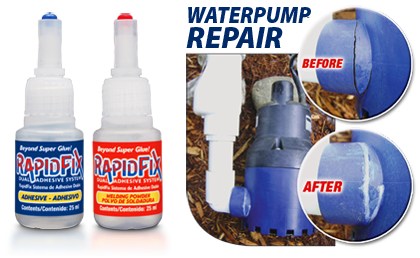 RapidFix conveniently combines both applications into one product. Other bonding products such as epoxy based adhesives require longer drying times ranging from 5 minutes to 24 hours. Similar products like Body filler or putty can take approximately 30 minutes or longer to set. RapidFix sets instantly!